More salmon in your diet really can help keep you healthy! It’s Healthy Eating Week this month (11-15 June) an ideal time to start thinking about making improvements to your diet. Salmon is a fantastic food because it’s packed full of Omega-3 fatty acids, which have some amazing benefits to your health! Alongside some other common UK species (like mackerel and herring) because salmon is rich in Omega-3 fatty acids it is classed as an 'oily' fish - which the Government recommends we all eat at least two portions of oily fish every week because of the health benefits this can bring. Omega-3 fatty acids are essential fatty acids your body cannot make on its own - they have to be acquired through the foods we eat. There’s widespread agreement from scientists about their health benefits of, including a reduced risk of heart disease and stroke and that Omega-3's can support the maintenance of strong and healthy bones and joints. A growing body of research also suggests evidence for other benefits such as improved brain function; supporting brain development in children; improved memory and even possibly delaying the onset of dementia. Omega-3's may also help sufferers of Parkinson’s and Crohn's disease, ease rheumatoid arthritis, reduce depression and help your skin healthy. Read more here. Plus of course, because salmon is a high-protein food, it’s great to eat if you’re preparing your body for a workout. Proteins keep your metabolism balanced, helping you to get in shape. And what’s more, salmon is also a great source of vitamins and minerals such as vitamins D and B-12. 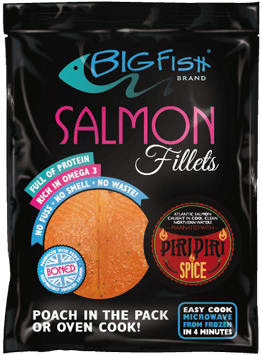 Here at BigFish Brand we work hard to make sure all the good nutrients in salmon stay there right through from freezer to plate. 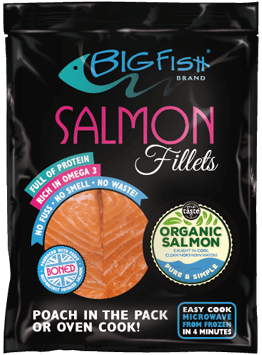 Our ingenious flash freeze and vacuum pack process keeps the salmon fresh for longer and makes sure it’s just as healthy and delicious straight from your freezer as it was the day it came out of the water. And, since we’ve lots of different ways to eat it, from smoked salmon to our seven flavours of marinated fillets, we doubt you’ll get bored with eating it. So, enjoy a healthier diet this Healthy Eating Week and make sure you get at least one portion of salmon!